We seized the opportunity to speak with engineers at the new Dropbox headquarters and get some advice on how to go from student to engineer at a successful tech company. 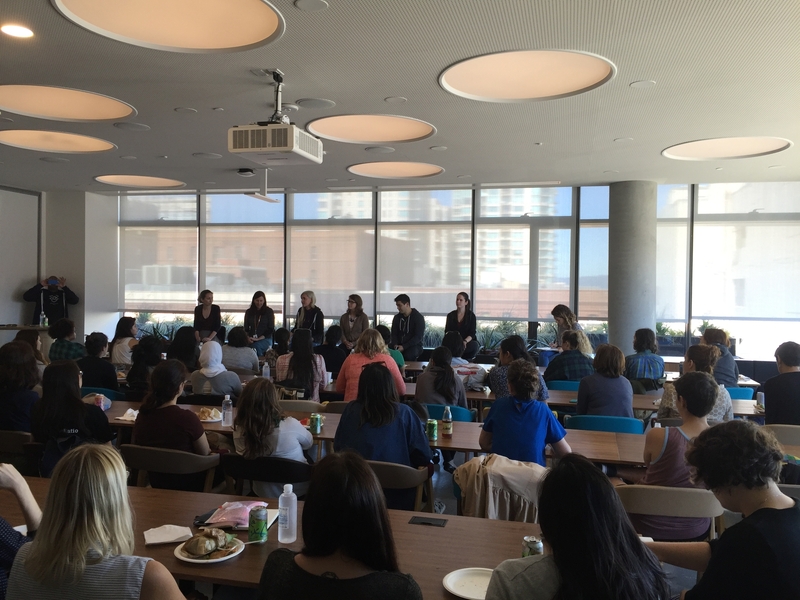 Dropbox engineers shared advice for women in tech including insider tips to help with job searches, new-hire training and mentorship. Join us as we step into a surprising world of themed rooms, roof-top exploration, and the minds of brilliant engineers. 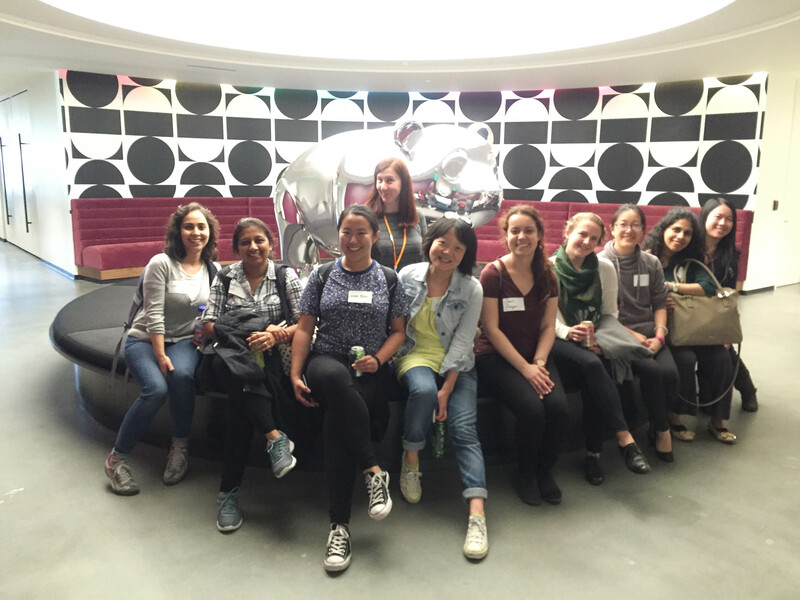 Dropbox hosted an exciting field trip for Hackbright Academy’s software engineering fellows and it started off with a warm welcome and tour of their new headquarters. 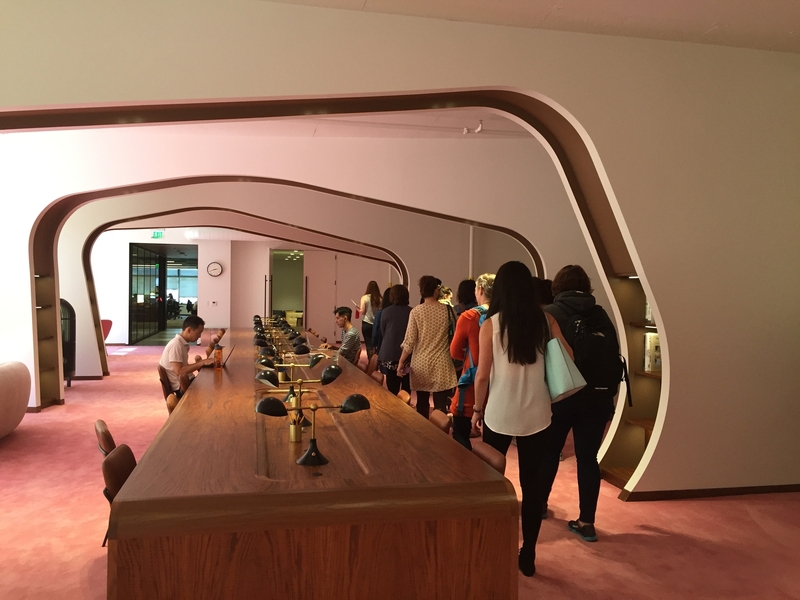 We explored all 5 floors and the roof of Dropbox in small groups, guided by members of the Dropbox team who shared insights into each floor. Many of the floors were designed based on a theme of the 5 senses–we saw the smell-themed first floor, where the Dropbox cafe sits and has coffee brewing every morning; the sights-themed second floor, complete with warm pink quiet office spaces and sky blue open office spaces for all styles of working; the taste-themed third floor that holds the Dropbox Tuck shop where masterchef-quality meals are served; and the sound-themed fifth floor, where we discovered the Dropbox music area with instruments for a full band. 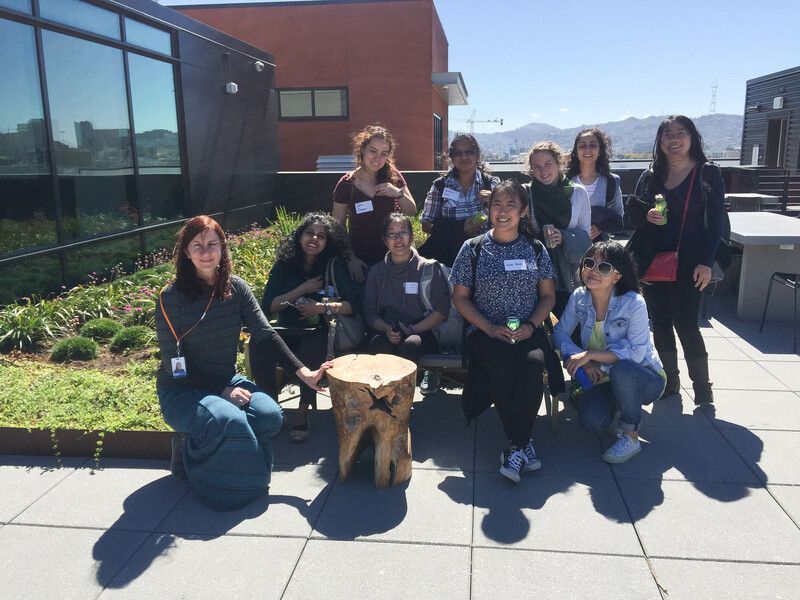 We also explored the Dropbox roof area, taking in views of the bay and imagining what it’d might be like to work outdoors on such a beautiful day. After our tour, we headed to the Dropbox 4th floor for lunch, and then the Dropbox team kicked off a panel that included network engineers, product managers, engineering managers and software engineers who had such great advice to share with us. What is Dropbox looking for when hiring entry level engineers, especially from coding bootcamps? What can we do to be competitive applicant? You want to work on things you can do to distinguish yourself from the pack and show what you are able to do. Make sure to share your code on any projects you build on Github so that people can take a look. Try rewriting something you’ve built in another language, or with a different database, to show that you can think in that next-level sort of way. Then speak at conferences about the things that you have built! You don’t need any kind of credential to do this–get together with a few people, build something, and then talk about what you’ve created publicly. You can also look into open source resources–many companies provide this–and try them out. Put yourself out there by attending conferences, and educate yourself by reading resources like High Scalability–that site provides insights on how tech companies have built their websites. When you are interviewing, show your willingness to learn and practice having a good mental model for what the code looks like—that’s more important than having the right answer off the bat to any question you might be asked. Also, show that you are competent at prioritizing. It’s so important to be able to tie what you are working on to how it affects business. Being able to break a larger project down into smaller pieces is a skill that managers value very highly! As you go through your jobs and roles in your career, keep in touch with people in a semi-professional and personal way—those connections are powerful now and down the line, and they can help you to get insider views or do research before you interview with companies you are interested in. Another great resource to explore is Cracking the Tech Career, by the same author of Cracking the Coding Interview Gayle Laakmann McDowell. Explore that as well for more advice! How would you describe the Dropbox culture around management and communication? There is a lot of interaction with managers and teammates—regular one on ones, chatting on Slack and on Google Hangouts, even traveling to Dublin to visit remote members of the team. In addition, regardless of who your manager is, there are a lot of people who you can talk to. When you are job searching, know that you are also interviewing your manager and the company as a whole. You want to gauge NOT whether or not I want to have lunch with this person, but rather, do I share the same work values as this person, are they trustworthy, and am I confident that I can share feedback that they will heed and respect? Dropbox culture values sharing things at a very early stage, even when they are not fully developed. That means you’ll need to be vulnerable enough to show your work process and your thoughts when they are not fully finished and be ok with that. Dropbox has also been one of the least aggressive places to work in because they focus on having everyone on board before moving forward, even if that makes things more complicated sometimes. They value that level of communication and collaboration. What is Dropbox doing to welcome and support people of color and women in the workplace? Dropbox’s Diversity Program works to support multiple initiatives around diversity, including employee resource groups like Women at Dropbox, Asians at Dropbox, Pridebox, Blackbox, and Latinbox to name a few. Dropbox team members are also empowered to create resource groups that aren’t already established. And, there is a robust and active Parents Resource Group provided at Dropbox. 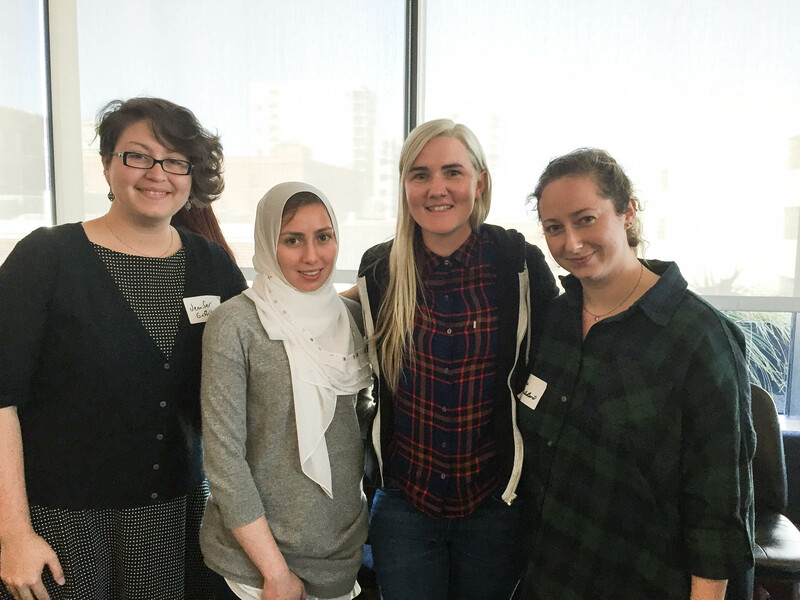 What does mentorship at Dropbox look like? You get paired with one mentor when you start at Dropbox, and that person teaches you about the codebase, helps you get set you up on systems, and is your go-to for things like how to use the vending machine. Plus, whenever you have a big change, you are provided with a new mentor to help you through that transition as well. When you are in mentor-mentee relationship, it’s ok to be a sounding board and listen to what each other are working on. Doing just that can be powerfully valuable. When asking questions, find out how they arrived at the answer to the question, or what they would have done differently, so you can learn both the answer and the thought process behind the answer. Also, look for organic relationships that can develop into mentorships instead of waiting to be matched/paired with someone as your mentor. Organic mentorships are some of the most powerful relationships! Have any of the panelists come from non-traditional backgrounds? What is your advice for us? Jensen got into tech through her love of neopets, but ended up attending a trade school to get her massage degree. She didn’t know that she could get into tech without a degree, but after talking with some friends who encouraged her, she took the leap and began teaching herself to code. She was determined in her job search, sending out a hundreds of applications until she got her start at OkCupid and began her career in tech from there. It’s important to be fearless in that hustle to get your next job. It’s ok to ask for help, put yourself out there, and put out seeds and start using that fearless attitude to look for companies that you want to work for and that match with what you care about. When someone tells you “you don’t come from Y, so why should I X,” treat that as an opportunity to close the gap in their understanding of your background and what you bring to the table, instead of reading that as something to keep you down. Be prepared for the job search. You won’t feel hopeful every day, but every single day you can apply for 5 more jobs. Set goals to keep pushing yourself and do what you can to keep yourself on target, so you can continue learning. It’s the volume vs. quality balance in the job search. 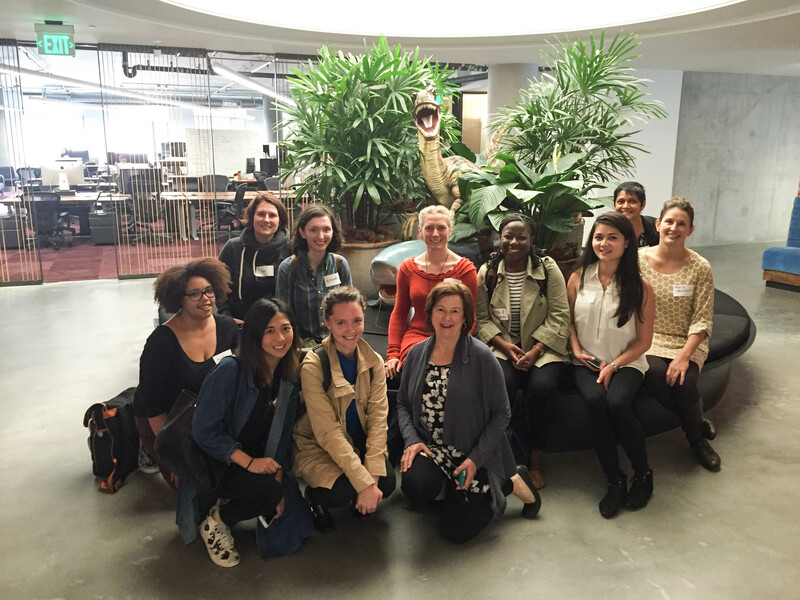 Kayla, a Hackbright alumna, was a biologist before transitioning into tech. She worked in customer services at a genomics company and was intrigued by coding as she started to imagine the SQL queries she could run for customer services requests she received. Her interest in video games also led her to explore the networks behind software, and that’s what officially landed her in tech. Kayla’s approach to her job search was to apply systematically; invest a lot of time and focus into the companies you really want to work one at a time, and do deep research so that you can apply in a targeted way and also interview extremely well. Amandine started out as a physicist but realized that programming helped with solving a lot of the problems she was tackling. She also wanted to write better code as a physicist and went to a hacker school to kick off her career in programming. Her advice is to continue learning on the job. Even if the first one you get isn’t perfect, it’s the perfect opportunity to learn so much of what you would never otherwise learn outside of a formal job. What do you think every software engineer should know? Be comfortable with the feeling that there’s still a lot to learn; to not feel stupid when you don’t know something, but to recognize that you just haven’t learned that yet and you will. Coordination, rather than technical skill, is most important when writing code. Thinking through problems, like how do I name this variable so that others aren’t confused later on when they read my code, are the details that make you a better engineer. Know the implications of the work you are doing—both in the business context and in the engineering context—and be attentive to the implications of all the code you write. That will make you so much better at your job and allow you to improve on what you are doing all the time. Be methodical about the things you do try, so you can measure the effect of them and narrow down issues to a specific problem. Document you problem solving so that someone else can also benefit from that later one. Respect the janitor more than the chairman in any role you are in–always greet the janitors and make the effort to connect with the people on your path. So much great information! 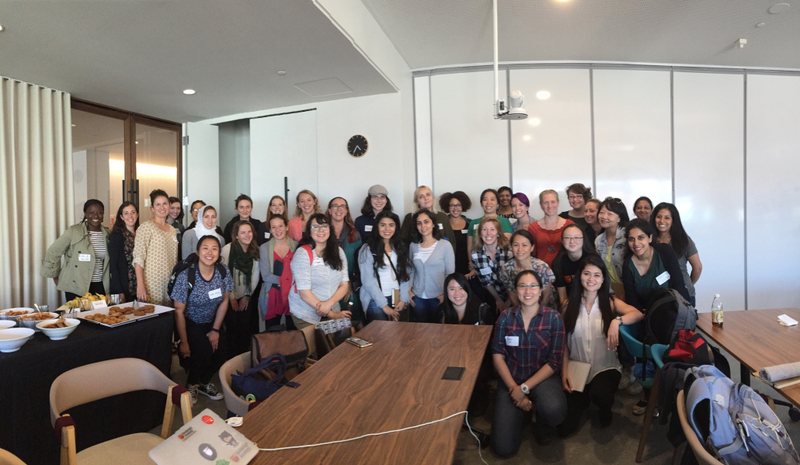 Thank you Dropbox for welcoming us into your space and getting us prepared and excited for our futures in tech.